Pippit is an all inclusive discovery tool that redefines the way users interact with blog content and everyday photos and videos. Founded by three renowned bloggers, Naomi and Josh Davis of Love Taza and Joy Cho of Oh Joy, the app allows users to keep up with their favorite bloggers, find helpful information about posts and bookmark desired activities and products. Pippit’s founders have built an extremely loyal fan base through their respective media channels. Joy has upwards of thirteen million followers on Pinterest, placing her as the most followed person on the platform, while Naomi and Josh currently hold a combined total of three hundred thousand followers via Instagram. As longtime bloggers, the highly influential trio wanted to create “a transparent mobile community that integrated blogging with social media and transformed the way people take part in experiences being shared with them,” says co-founder Josh Davis. Pippit is filled with fun and useful features aimed at redefining the blog viewing experience. Serving to bridge the gap between social media and e-commerce, “Dots” allow a user to shop for the exact pair of shoes shown on a blog post or find detailed instructions for a DIY project their favorite blogger just shared. This feature positions Pippit as the ultimate time saving app, eliminating cumbersome research and allowing users to quickly purchase items inspired by their favorite bloggers. Joy Cho notes, “Dots lets bloggers actively share experiences with followers,” thereby breaking the fourth wall and positioning the viewer as an active participant. This paradigm-shifting feature streamlines the connection between the blogger and the user--with a single tap of a “Dot,” the user has all the information they need. Pippit allows users to follow their favorite bloggers, friends, and brands while proactively bookmarking items and activities they like along the way. Love Taza’s Naomi Davis notes, “ I love this feature because I feel like I’m always taking screenshots of things in my social media, but then forgetting about them because they are so unorganized in my phone’s photo album.” This feature encourages users to actively bookmark products or activities they like and helps to keep them organized; thus, transforming the traditional method in which users consume and interact with blog content. 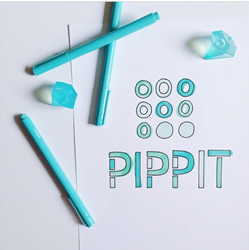 Pippit is the ultimate discovery tool to find inspiration, keep up with bloggers, and share everyday photos and videos. The well-known bloggers have partnered with Y Media Labs, a leading San Francisco Bay Area based mobile app interactive agency, to create Pippit. The app is now available on the App Store.